Q: We just bought some great live oaks and have them planted, ragged hole, flare showing and mulched. But one problem I am noticing, the tree asps are quite plentiful. What's your recommendation the treat the asps and keep them at bay? 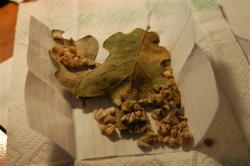 A: Sounds more like wooly oak galls than asps (puss caterpillars). A heavy population indicates some stress in the tree and the Sick Tree Treatment should be applied.